To inform you what can happen when your RV is exposed to extreme cold temperatures. To suggest what you should inspect and do to the RV after the frigid weather, and before your next camping trip. 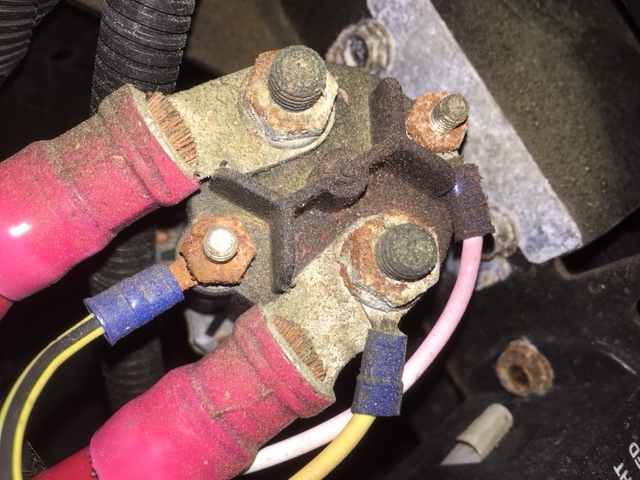 To suggest some preventive maintenance to help prevent this from happening to your RV again. In January 2019 we experienced a deep-freeze, or what is known as a polar vortex in regions around the country. Wind chills were predicted to be minus 40 to minus 65 degrees in some areas with low temperatures ranging from minus 12 to minus 40 degrees. The frigid conditions wreaked havoc on everything in its path. When polar vortex type weather is headed where you live, your priorities are focused on life safety, and things like automobiles and RVs are put on the back burner. Now, the polar vortex has come and gone and it’s time to see what it left in its wake. What should you be concerned about when you check your automobile or RV after a polar vortex or hard-freeze? When you talk about frigid weather and RVs the first thing that comes to mind is the RV’s plumbing system. Most RV owners understand how important it is to protect the RV’s plumbing system from freezing temperatures, but what about polar vortex like weather. Of course, 32 degrees F or 0 degrees C is the freezing point of water, but there are several variables involved as to when plumbing lines will freeze solid. Variables like, how much water there is? What the temperature around the water is? How long did the temperature stay below freezing? Is the water protected by insulation? When outside temperatures drop several degrees below freezing ice starts to form, and water in plumbing lines can freeze. If the temperature rises the next morning you might be okay, but if temperatures stay below 32 degrees F unprotected plumbing lines will freeze, expand and possibly rupture. The colder the temperature is the quicker plumbing will freeze. Damage to plumbing lines during a hard-freeze is common in RVs, especially in older RVs with older plumbing. If the water system wasn’t properly drained, or if the plumbing system wasn’t properly winterized, expect some freezing during polar vortex like temperatures. When I worked at an RV dealership, every spring people brought their RVs in with damaged water lines caused by freezing. Some owners did not winterize the RV at all, and some did winterize the RV but not the right way. The bottom line is, the water lines froze and were damaged. 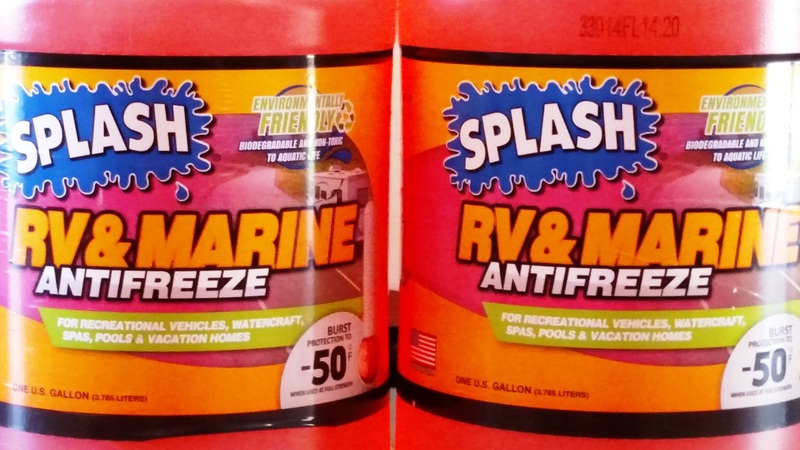 Tip: RV antifreeze uses propylene glycol and is non-toxic. Automotive antifreeze uses ethylene glycol and is toxic to pets and humans. Something you don’t hear much about is the freeze point, and freeze burst point for non-toxic RV antifreeze. RV antifreeze is available in minus 50 degrees F and minus 100 degrees F freeze burst protection. But, the minus 50 degrees F antifreeze has a freeze point of +12 degrees F. What this means is, at full strength it will start to freeze (get slushy) at +12 degrees F, but the freeze burst point is minus 50 degrees F. The minus 100 degrees F antifreeze has a freeze point of minus 60 degrees F and a freeze burst point of minus 100 degrees F. The minus 100 degrees F antifreeze uses more propylene glycol and is more expensive. 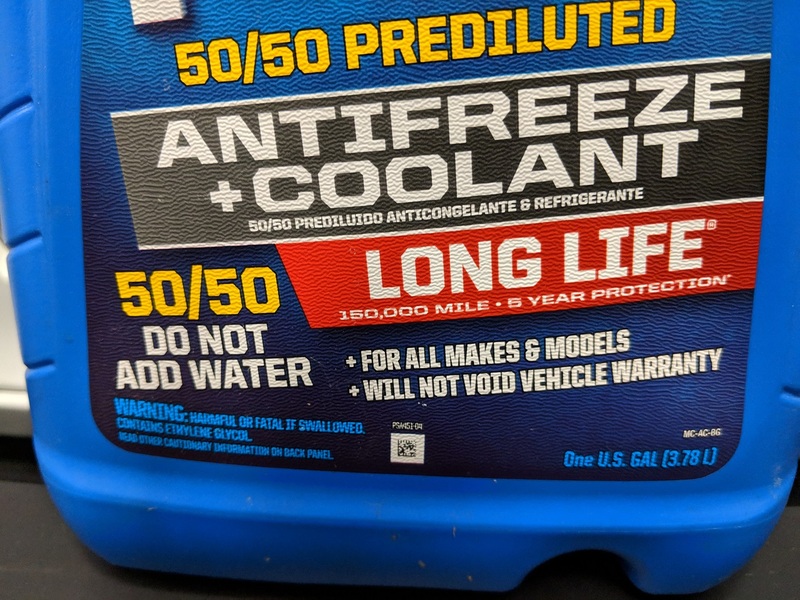 Typically, in most regions of the United States the minus 50 degrees F RV antifreeze works fine, but not necessarily when there is polar vortex temperatures like we experienced in January 2019. And keep in mind, the freeze point and burst point is based on pure antifreeze, not when it is diluted with water. What will likely freeze in the RV plumbing system? You are definitely in trouble if temperatures drop below freezing and you did not winterize the RV’s plumbing system. And it is possible for parts of the plumbing system to freeze even if the unit was winterized. This is why it’s important the RV is properly winterized. Plumbing lines and fittings can freeze, especially in polar vortex like temperatures. 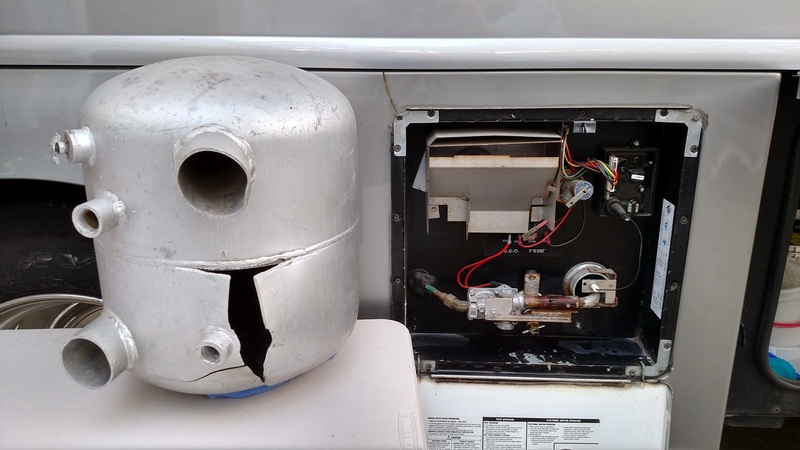 The RV water heater tank can freeze, expand and rupture if it wasn’t properly drained or winterized. The city water inlet (one-way valve) can hold water and freeze if not properly winterized. Ice makers, washing machines and dishwasher plumbing can freeze if not properly winterized. Holding tanks that were not drained and winterized can freeze. The flush valve in the toilet can hold water and freeze if not properly winterized. The outside shower can freeze if not properly winterized. 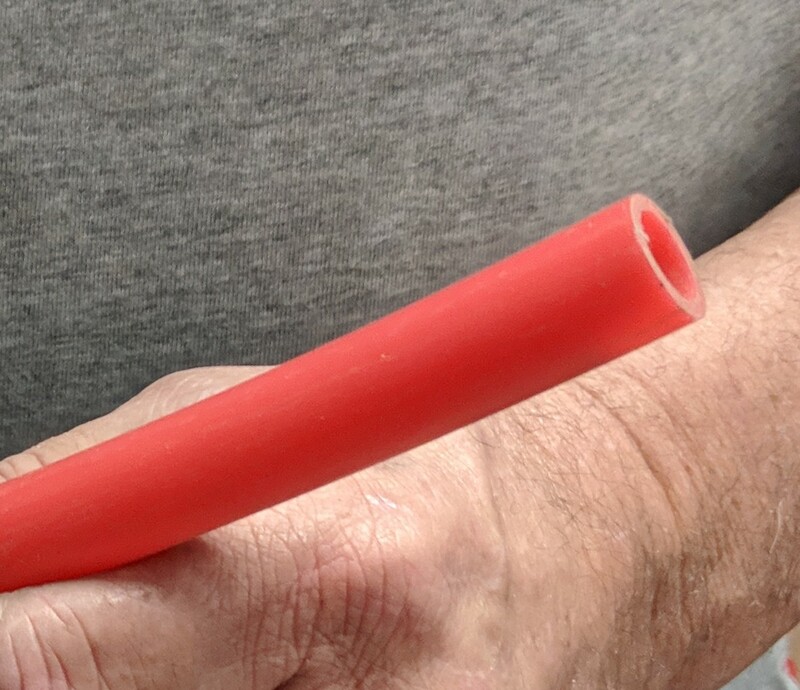 The good news is, newer RVs use PEX tubing in the plumbing system. PEX is a polyethylene tubing that uses a crimp ring and crimping tool to install the plumbing lines and fittings. If the PEX tubing does freeze it can expand (to some degree), and is less likely to rupture than other types of plumbing. But, PEX tubing can freeze, expand and possibly rupture. More good news, if you are mechanically inclined you can repair your own PEX tubing. You have the option of purchasing and using crimp rings and a crimping tool, or you can use push on fitting that are easier to work with. 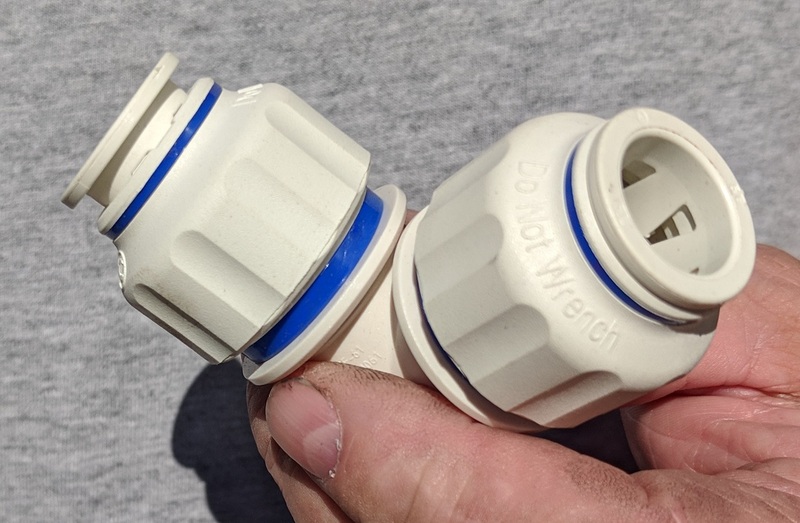 With a PEX tubing cutter and push on fittings (available at home improvement stores) you can repair any damage to the PEX tubing that you have access too. 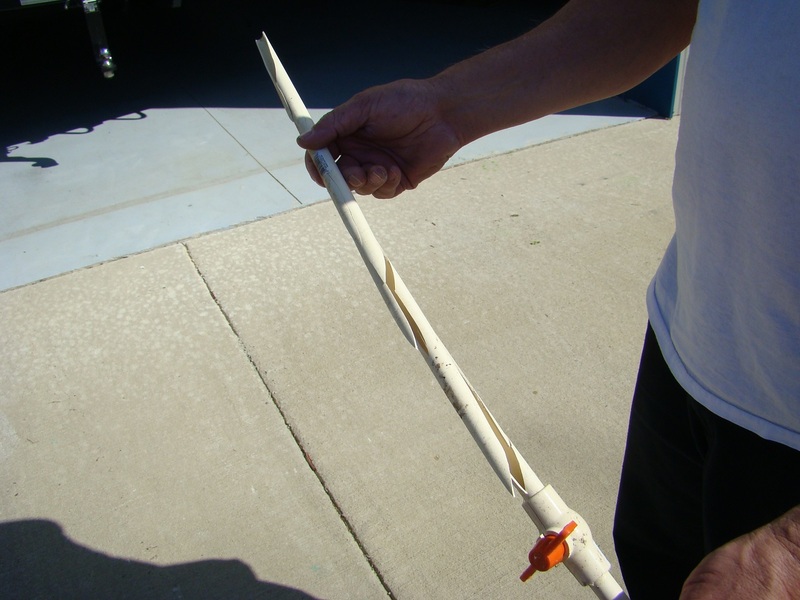 If you suspect the plumbing lines in your RV froze, what should you do? That’s a good question. There is one fairly simple approach to check for leaks in the RV’s plumbing system that owners can do. Keep in mind, this will only help identify potential leaks, locating the leak is another story. After the freezing temperatures are over, add several gallons of potable water to the fresh water holding tank. Make sure all the faucets are closed and any low point water drains, or other plumbing components like the outside shower are closed. Turn the 12-volt on-demand water pump on, and let it pressurize the system. The pump is designed to shut off when it reaches a designated pressure. If the pump runs continuously it is likely water is leaking somewhere in the plumbing system. Don’t let the pump keep running if you suspect a leak, or water will be everywhere. Using the water pump like this is an easy method to see if there is a leak in the system, but you won’t know where the leak is unless it is quite visible. Try to access any part of the plumbing system you can to identify the leak, and keep in mind there can be more than one leak. If you can’t find the leak yourself you might need to take the RV to your local dealer where they have other test equipment and methods for locating the leak. The only way to protect the RV plumbing system from freeze damage is to properly winterize the plumbing system. There are basically two methods for winterizing the RV plumbing system, using compressed air, and using non-toxic RV antifreeze (or a combination of both). I started winterizing RVs as a kid when I worked for a dealership in Pennsylvania. I later winterized RVs when I worked at a dealership in NC. I learned a fool-proof method for winterizing the RVs plumbing system, and if you want to do the work yourself we offer a comprehensive winterizing and storing your RV online course. If you don’t do the work yourself, make sure whoever does it does it right. What about lead-acid batteries and other types of batteries in freezing temperatures? All automotive and deep-cycle batteries can freeze, especially when they are not fully charged. I am sure at one time or another you or someone you know attempted to start your car in cold weather and it would not start. The most common reason for this is a weak or dead battery. Extreme cold temperatures zap the stored energy from a weak or damaged battery. If the battery is fully charged, it has a better chance of starting a vehicle during frigid temperatures. Tip: A fully charged battery can tolerate temperatures to minus 70 degrees F.
A battery in any of these conditions will experience problems in extreme cold weather. 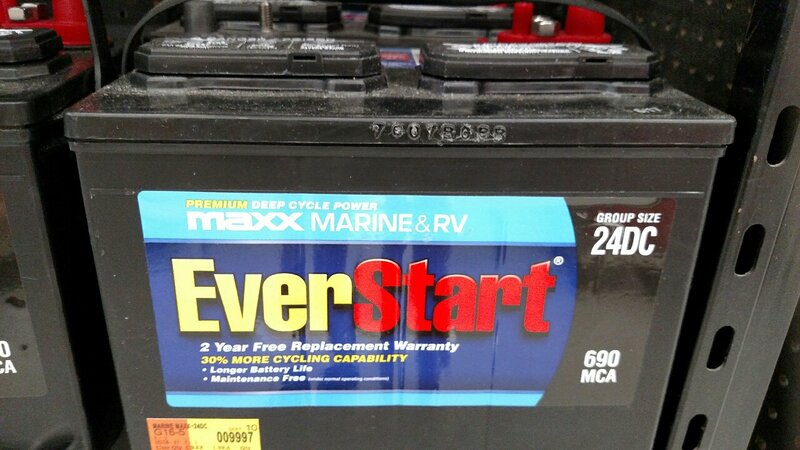 A weak or damaged battery cannot provide the power required for the engine’s starter to start the vehicle. During a hard-freeze or polar vortex like temperatures batteries can freeze solid. A weak or discharged battery can freeze at 32 degrees F. The electrolyte in a lead-acid battery is roughly 30 percent sulfuric acid and 70 percent water. As a lead-acid battery ages, and throughout its lifespan had water added to it, the battery is more susceptible to freezing. When a battery is damaged or not fully charged it will freeze, expand and can damage cells and/or crack the battery casing. When I was in the Army, stationed in Germany, and we had hard-freeze weather conditions, soldiers had to report to the motor pool every four hours to start all of the vehicles. Starting the vehicles helped prevent frozen batteries, and allowed partially discharged batteries to start the vehicles and tanks. And by running the vehicles for 20 to 30 minutes every four hours the batteries were getting charged. It’s safe to say, we are not going to get up every four hours to start our car or RV, so what should we do after the cold weather subsides? Hopefully your batteries were fully charged, or the RV was plugged into electricity so the batteries can charge, and they survived the polar vortex. But, prior to starting a vehicle after a hard-freeze it’s a good idea to visually inspect the battery. Caution: If the battery looks swollen or has any cracks in the casing do not attempt to use it. If you suspect the battery froze, or if it is still frozen it needs to completely thaw out before attempting to use it. It’s best to put the battery in a warmer environment and let it thaw out on its own. You can get a quick picture of the battery’s state of charge using a multi-meter. Set the meter to read 12-volts and put the red lead on the positive terminal and the black lead on the negative terminal. If the reading is 12.5 or higher it should start the vehicle. Readings below 12.5 indicated a discharged battery and it will need to be charged or jump started. Make sure the battery is completely thawed and turn everything off that draws power from the battery. At this point it is okay to try and start the vehicle. Do not use a battery that is swollen, or has a crack in the casing. If a battery is weak or damaged it’s best to take it to a professional and have it inspected. How can You prevent this from happening in the future? The best and easiest way to prevent battery damage during cold weather is to make sure the battery is fully charged at all times. A discharged lead-acid battery that is not recharged in a timely manner will start to sulfate, and if left in this condition will damage the battery. Keeping the batteries charged will prevent sulfation, and help the battery survive through extreme cold temperatures. 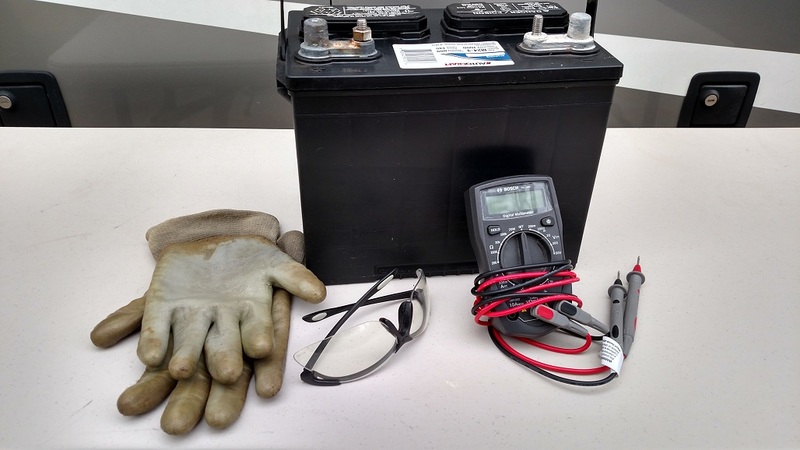 If you would like to learn more about deep-cycle batteries we offer a Battery Care & Maintenance e-book course in our RV online training. Another concern in extreme cold weather is the condition and concentration of automotive antifreeze in the vehicle’s radiator and engine block. If you ever looked at a jug of automotive antifreeze you probably noticed that some antifreeze is a 50/50 mixture, and some is full strength. The 50/50 mixture is a premixed solution that is half automotive antifreeze and half water. For most regions of the country a 50/50 mixture is enough protection against freezing. A 50/50 mixture is good to about minus 35 degrees F. In colder regions it’s best to fill the vehicle’s cooling system with full strength antifreeze at a ratio of about 70 percent antifreeze to 30 percent distilled water. Tip: Automotive antifreeze uses ethylene glycol which is toxic to pets and humans. Problems with automotive antifreeze concentration levels start when there is more water than antifreeze. This can happen in a couple of ways. One is when a vehicle overheats and after it cools down you fill the radiator with only water and no antifreeze. Another example would be, using a 50/50 mixture of antifreeze and then adding more water to finish filling the cooling system. In these situations, it is possible to freeze in polar vortex like temperatures. An engine block has what is referred to as freeze plugs pressed into the block. Freeze plugs are there in the event water in the block freezes and expands; the plugs are designed to be forced out of the engine block to prevent the block itself from cracking. It is much less expensive to replace freeze plugs than an entire engine. How can I prevent this from happening to me in the future? It’s easy, know what the antifreeze concentration is in your vehicle’s cooling system. You can purchase an inexpensive antifreeze hydrometer at your local auto parts store and test it yourself, or take it to a mechanic and have it tested prior to winter. This is an easy way to prevent a costly disaster. While on the topic of automotive antifreeze, you should have the coolant flushed and replaced at the intervals listed in the vehicle’s owner manual. 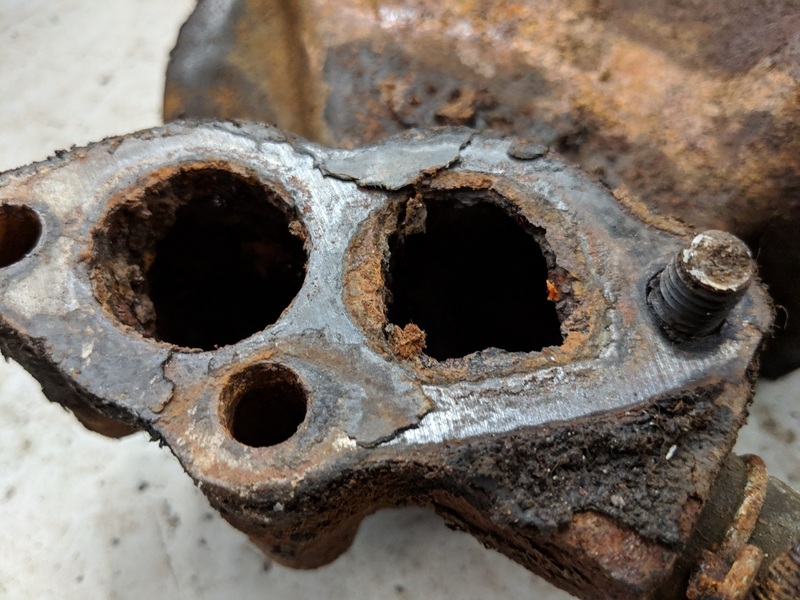 Rust and corrosion inhibitors are added to the antifreeze, and as it ages these inhibitors no longer do their job. If you ever saw rusty colored antifreeze, or corrosion starting to form in the radiator this is why. Don’t forget the windshield washer fluid. In temperatures like we are discussing here, you will need fluid that is protected against freezing. One person I talked to (who lives in MN) recommended -30 or better fluid. If you forget the windshield washer fluid it can freeze all of the parts and pieces that make up the washer system. As for seams and sealants on the RV, versus extreme cold temperatures, the main concern is expansion and contraction. Your RV is constructed using all kinds of materials. In extremely cold weather these materials will contract more than they would under normal temperatures. As the materials warm up again, they expand. This expansion and contraction (especially in frigid temperatures) can result in some of the sealants leaving small gaps or cracks in the seams. Sealants are used on most RV seams (rather than caulk) because sealants are flexible, and better suited to form a barrier or seal where metal or other materials expand and contract. After experiencing polar vortex like temperatures, I recommend a trip around the RV and up on the roof to inspect all of the sealants. Look closely for any peeling, cracking or separation that would allow water to penetrate the surface. Every fall, prior to putting our RV in storage I clean the roof and inspect all of the RV seams and sealants. You can reseal damaged sealants yourself, or take the RV to your local RV dealer and have it inspected and resealed as necessary. Prior to resealing any sealants on the RV you need to thoroughly clean the old sealant, and the surrounding surface so the new sealant can adhere to the surface. For the roof I use a rubber roof cleaner first to clean the area I plan to reseal, followed by some denatured alcohol on a clean cloth as a final preparation. If the old sealant you are resealing has lifted or separated from the surface and can be removed go ahead and remove it. Otherwise, it’s best to leave it alone and seal over the old sealant. Make sure you use the correct sealant for the surface you are sealing. Consult your RV owner’s manual or local RV dealer for the proper sealant. 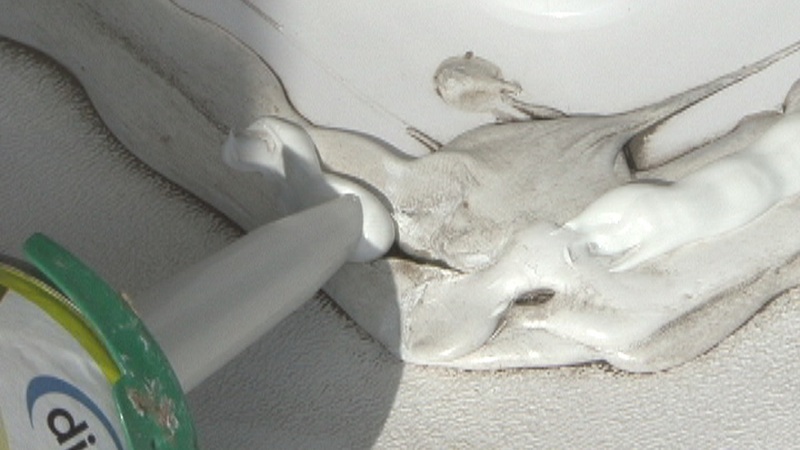 Use a standard caulking gun and run a bead of sealant over the area you are resealing. If you are sealing a crack or separation in the old sealant you don’t need to apply as much sealant as you would for a new application. To learn more about maintaining your RV we offer RV Care & maintenance video and e-book training in out online training program. 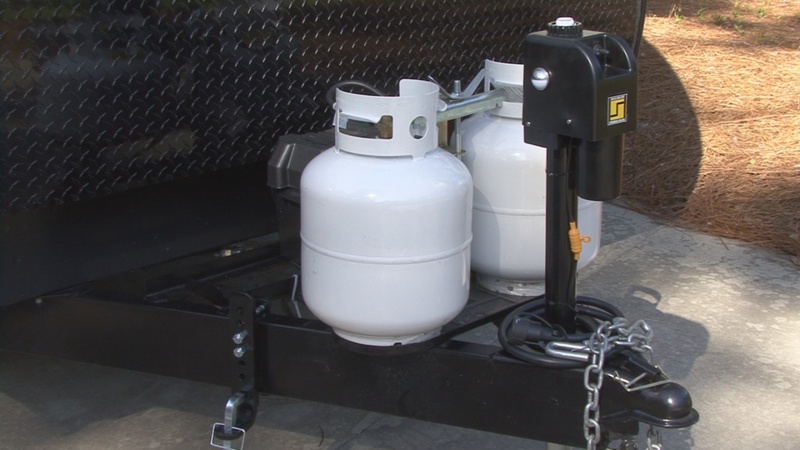 Propane or liquid propane, is ideal for use on RVs. You seldom have any problems, even when it’s cold outside. Propane is stored in containers under pressure as a liquid. The boiling point for propane is minus 44 degrees F. When propane boils it changes from a liquid to a gas. So, as long as temperatures around the container are minus 44 degrees F or higher the liquid propane can turn into a vapor and supply gas to the RV’s appliances. If polar vortex like temperatures drop below minus 44 degrees F you can experience problems with the liquid turning to a gas vapor, and the problem can escalate when the LP gas container is getting low on propane. When temperatures really plummet, and you plan to use the RV there are LP gas heating blankets and wraps on the market that will keep the LP gas flowing to all the appliances. This definitely is not my wheelhouse, but what I can say is, most electronic equipment intended for use in RVs is typically designed to deal with the excess vibration and temperature swings RVs are subjected to, but that doesn’t necessarily mean polar vortex like temperatures. All electronic equipment, for example LCD televisions, have high and low temperatures set by the manufacturer that the TV can operate within. When the TV is exposed to temperatures outside of those parameters it should not be used. Another concern is your own portable devices like smart phones, tablets and laptop computers. These too, have a range of temperatures they are designed to operate in. Because RVs are stored in harsh conditions (as opposed to a climate controlled house) these devices can be damaged by both temperature and condensation. How to prevent damage to electronic equipment during periods of cold temperatures? If televisions are exposed to frigid temperatures you need to allow sufficient time for it to return to normal temperatures before attempting to use it. Do not ever leave portable electronic equipment in the RV during storage. Both extreme hot and cold temperatures can damage these devices. It will be up to you to locate and read the operator and owner’s manuals for electronic equipment used in your RV. Synonymous with frigid weather is snow. Snowfall can accumulate quickly. Snow is heavy and slide-out toppers cannot support much weight, so hopefully if your RV has slide-outs they were in the stored position prior to the snow and extreme cold weather arriving. You don’t want heavy wet snow to sit on the RVs roof for extended periods of time either. It’s a good idea to remove snow from the roof, but it can be dangerous to do. You can’t always see things on the roof that are covered by snow like roof vents, plumbing vents and other obstacles. And the RV roof is extremely slippery when covered by snow and ice. Tripping or falling could be disastrous. I recommend using a step ladder and push broom to remove the majority of snow accumulation from the roof. 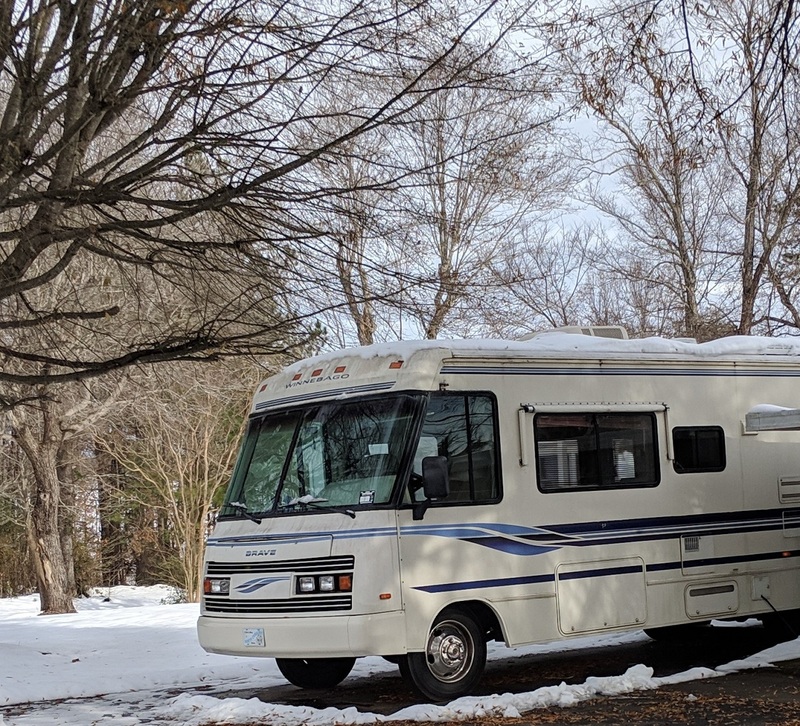 If you choose to actually go on the roof to remove snow, only adults familiar with the RV’s roof should attempt to go on the snow-covered roof. But as I mentioned a moment ago the best option is to use a step ladder. If the RV roof is not designed to support weight, or walking on the roof, use the step ladder to remove the snow. Do not use anything with a sharp edge that could damage the roofing material, a push broom will usually do the job. I talked earlier about roof seams and sealants and expansion and contraction. After the snow has all melted it’s a good idea to go on the RV roof and inspect your seams and sealants, or have somebody do it for you. It’s good preventive maintenance, and if you catch a small crack or separation in the sealant early you can save on costly repair bills. You can’t stop it from snowing, but the best prevention against possible water damage from melting ice and snow is to keep the RV covered. If you don’t have a garage or overhead shelter available to protect the RV, my recommendation is to invest in a quality RV cover for the type and size RV you have. Unfortunately, if you left food and drinks in the RV during polar vortex like temperatures it most likely froze, and depending on what it was the container could freeze, expand and rupture. This can make a mess when things thaw out. Another concern is what can happen to some food when it freezes. For some good information on what to do in the event canned goods are frozen visit this link. RV tire tips: If you plan to use your RV during extreme cold weather keep in mind as the temperatures plummet tires lose air pressure. It’s important to check and adjust tire inflation pressures during cold temperatures. When the RV is stored during cold weather inflate the tires to the manufacturers recommended pressure (because they will lose air) and use some type of blocking or barrier to keep the tires off of the frozen ground. Make sure whatever you use as blocking is wider than the tire’s footprint, so no section of the tire overhangs from the blocking. I probably left some vehicle and RV related information out like problems with diesel fuel, that are directly affected by extreme cold temperatures, but this is a great start to get your vehicle and RV back to normal operating condition after frigid temperatures subside. If you are interested in learning more about using or maintaining your RV visit our RV Online Training Program site. It will be the talking points for the show and we’ll post the link to the article. Hell, if I’m a dealer I would email this article to all my customers (with full credit to RV Education 101) and offer to do a “Post Polar Vortex Winter Check-up” for “X” number of dollars. It would bring people into the dealership and then you get more service work and some parts/accessory sales. For those who like the DIY approach, you have done your customers a great service by sharing this information and then they check out YOUR website and order more education and training materials, including some of your online training course.